When your dog goes missing you want to be sure that you use every available tool at your disposal to help you. Thankfully, technology has made some great leaps and bounds in the last couple of years and today we want to tell you about two different search features you’ll want to use. Pet Harbor is a database used by many of the large animal control facilities including Milwaukee Area Domestic Animal Control Commission (MADACC) and Chicago Animal Care and Control (CACC). You can search the listings manually for your lost pet but better yet, you can register to receive emails every time a possible match for your dog is entered in the system. Petango has a similar feature. Petango is a shelter software system that lists adoptables and lost pets and is used by hundreds of shelters across the country. It has a feature called Petmatch that is designed to alert you when the type of dog that you want comes up for adoption. But this can also be used to alert you when a dog similar to your lost dog is brought into a shelter. Enter the details and you will be sent an email notification when there is a possible match. Just recently, we saw how useful this email notification service can be. 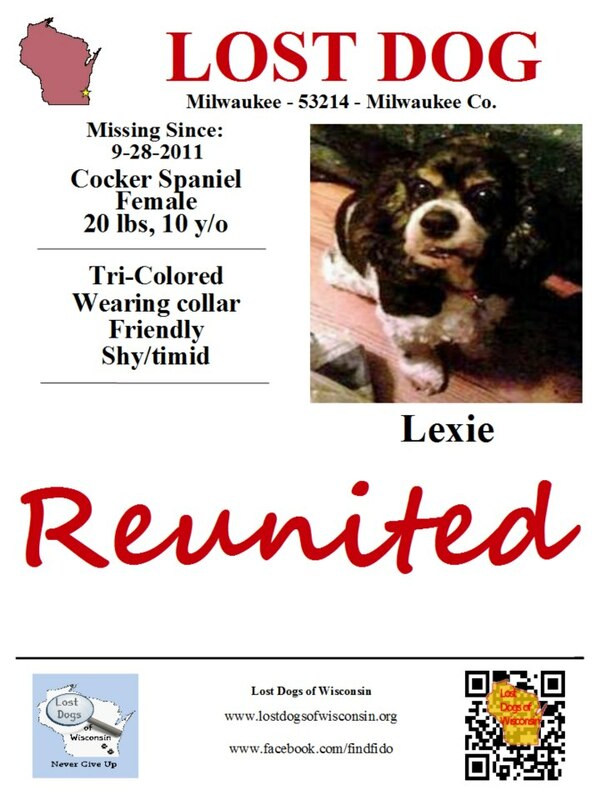 Lexie is a female cocker spaniel who went missing from her Milwaukee home in late September 2011. The owner used the PetHarbor system to alert her to similar matches and after almost a year, Lexie’s owner got the email she was hoping for. A similar match had been brought in to MADACC and it was indeed Lexie! Of course, computer-made matches shouldn’t substitute for calling and visiting a shelter in person, but they can be a very useful tool, especially to scan shelters far away or for searches that go on for months and years. Remember, never give up! Lexie is very glad her owners didn’t!